Inster and GovSat successfully performed a satellite “Comms-on-the-move” live demo providing bi-directional video and data transmission over a 5 Mbps link in X-Band. Governmental users can benefit from X and military Ka-Band technologies for critical missions in which “On-The-Move” satellite communications are required. 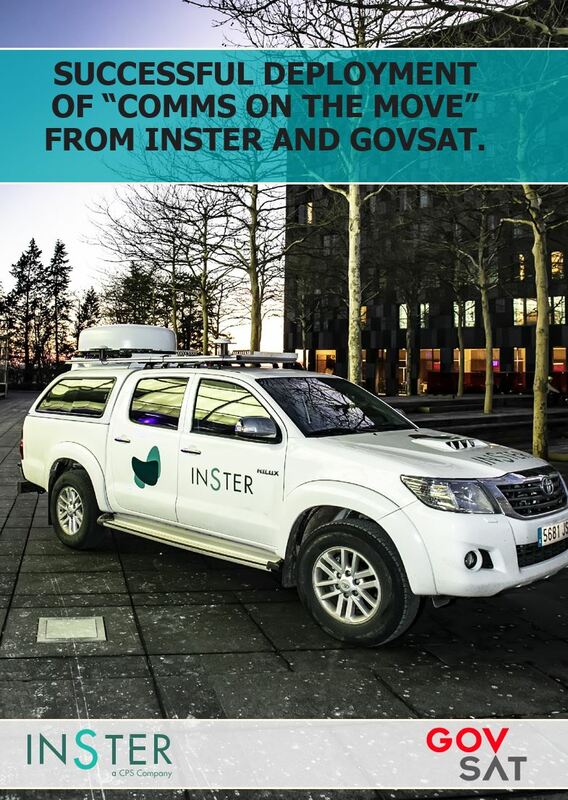 Coinciding with the GOVSATCOM 2019 Conference held in Luxembourg, Inster and GovSat have successfully performed a X-band “Comms on the move” demo, obtaining a stable transmission of 5 Mbps while traveling from Madrid, where Inster’s headquarters are located, to the European Convention Center in Luxembourg, where the conference took place. The terminal established a SatCom link via GovSat-1, a multi-mission satellite equipped with the latest technology that offers X-Band and military Ka-Band capacity over Europe, Africa, the Middle East, and substantial maritime coverage over the Mediterranean and Baltic Seas, as well as over the Atlantic and Indian Oceans. During the journey, Inster’s engineering team, in collaboration with GovSat’s Mission Operation Center’s (MOC) specialists, where able to create a stable SATCOM link, allowing for web-browsing, video conference, and video streaming while driving at over a 100 km/h. The reacquisition time was also tested after going through tunnels, turning out to be quasi-instantaneous, as the terminal incorporates a high precision Inertial Navigation System (INS), which sends the vehicle movement information to the ACU, which then computes the relative position between the satellite and the vehicle in order to be prepared to reacquire the signal once the line of sight with the satellite is recovered. On the other hand, thanks to its dual capacity in X- and military Ka-Bands, GovSat-1 satellite offers a wide range of services, capacities and coverage areas for governmental and military users. GovSat-1 is a highly secure satellite with encrypted command and control, and anti-jamming capabilities.